Seminars are taught by one of our planners with over ten years of experience in education and finance. By registering for the National College Planners workshop, absolutely none of your information will be sold or solicited. National College planners maintains the strictest of security standards, and will absolutely never share any of your private information including, but not limited to, names, addresses, phone numbers, or email addresses. Your information will only be viewed by National College Planners employees, all of which have undergone background checks. We will only contact you regarding National College Planners business such as notification of an appointment or reminders of workshop dates. 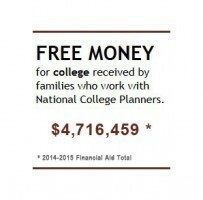 We thank you for registering with National College Planners.